"GOES" redirects here. For other uses, see GOES (disambiguation). GOES-8, a decommissioned United States weather satellite. Three GOES satellites are available for operational use. GOES-16 occupies the GOES-East position at 75°W. This satellite, which was designated GOES-R before orbiting, was launched by a Atlas V rocket from Space Launch Complex 41 at Cape Canaveral Air Force Station in Florida on 19 November 2016. It underwent Post-Launch Testing through early 2017 before replacing GOES-13 as GOES-East. GOES-14 is in storage at 105°W. The launch of this satellite, which was designated GOES-O before orbiting, was delayed several times. It was launched successfully on 27 June 2009 from Space Launch Complex 37, piggybacking on a Delta IV rocket. It underwent Post-Launch Testing until December 2009 and then was placed in on-orbit storage. This satellite is a part of the GOES-N Series. GOES-14 has been and will be activated should another GOES satellite suffer a problem or be decommissioned. It was temporarily designated GOES-East because of technical difficulties with GOES-13 and moved towards the GOES-East location. After resolution of those problems, GOES-14 was returned to storage. GOES-15, which was designated GOES-P before orbiting, was launched successfully on 4 March 2010, It occupies the GOES-West position and is located at 135°W over the Pacific Ocean. It is scheduled to move eastward to 128°W beginning on 29 October 2018 in order to make room for GOES-17, which is intended to take over the GOES-West position on 10 December 2018. Several GOES satellites are still in orbit but are either inactive or have been re-purposed. Although GOES-3 ceased to be used for weather operations in 1989, it spent over 20 years as a critical part of communications between the U.S. and Amundsen–Scott South Pole Station before being decommissioned in 2016. Geostationary satellites expend fuel to keep themselves stationary over the equator, and thus cannot normally ordinarily be seen from the poles. When that fuel is depleted, solar and lunar perturbations increase the satellite's inclination so that its ground track begins to describe an analemma (a figure-8 in the north-south direction). This usually ends the satellite's primary mission. However, when the inclination is high enough the satellite may begin to rise above the polar horizons at the extremes of the figure-8, as was the case for GOES-3. A nine-meter dish was constructed at the station, and communication with the satellite could be obtained for about five hours per day. Data rates were around 2.048 megabytes/second (bi-directional) under optimum conditions. GOES-8, which was designated GOES-I before orbiting, was the GOES-East satellite when it was in operation. It is in a parking orbit and is drifting westerly at a rate of about 4 degrees daily. It was decommissioned on 1 April 2003 and deactivated on 5 May 2004 after the failure of its propulsion system. GOES-10, which was designated GOES-K before orbiting, was decommissioned on 2 December 2009 and was boosted to a graveyard orbit. It no longer had the fuel for required maneuvers to keep it on station. GOES-11, which was designated GOES-L before orbiting, had a partial failure on 6 December 2011. It was decommissioned on 16 December 2011 and boosted into a graveyard orbit. GOES-12, which was designated GOES-M before orbiting, was decommissioned on 16 August 2013 and boosted into a graveyard orbit. GOES-13, which was designated GOES-N before orbiting, was decommissioned on 3 January 2018 and boosted into storage orbit. Coverage map of GOES-11 and GOES-12 when active (2007). Designed to operate in geostationary orbit 35,790 kilometres (22,240 mi) above the Earth, the GOES spacecraft continuously view the continental United States, the Pacific and Atlantic Oceans, Central America, South America, and southern Canada. The three-axis, body-stabilized design enables the sensors to "stare" at the Earth and thus more frequently image clouds, monitor the Earth's surface temperature and water vapour fields, and sound the atmosphere for its vertical thermal and vapor structures. The evolution of atmospheric phenomena can be followed, ensuring real-time coverage of meteorological events such as severe local storms and tropical cyclones. The importance of this capability was proven during hurricanes Hugo (1989) and Andrew (1992). The GOES spacecraft also enhance operational services and improve support for atmospheric science research, numerical weather prediction models, and environmental sensor design and development. Satellite data is broadcast on the L-band, and received at the NOAA Command and Data Acquisition ground station at Wallops Island, Virginia from which it is disseminated to users. Additionally, anyone may receive data directly from the satellites by utilizing a small dish, and processing the data with special software. The GOES satellites are controlled from the Satellite Operations Control Center in Suitland, Maryland. During significant weather or other events, the normal schedules can be altered to provide the coverage requested by the NWS and other agencies. Space Weather -- March 2012. GOES-12 and above also have provided a platform for the Solar X-Ray Imager (SXI) and space environment monitoring (SEM) instruments. The SXI provides high-cadence monitoring of large scale solar structures to support the Space Environment Services Center's (SESC) mission. The SXI unit on GOES-13, however, was damaged by a solar flare in 2006. The SESC, as the nation's "space weather" service, receives, monitors, and interprets a wide variety of solar-terrestrial data. It also issues reports, alerts, and forecasts for special events such as solar flares or geomagnetic storms. This information is important to the operation of military and civilian radio wave and satellite communication and navigation systems. The information also is important to electric power networks, the missions of geophysical explorers, Space Station astronauts, high-altitude aviators, and scientific researchers. The SEM measures the effect of the Sun on the near-Earth solar-terrestrial electromagnetic environment, providing real-time data to the SESC. The main mission of a GOES satellite is carried out by the primary payload instruments, which are the Imager and the Sounder. The Imager is a multichannel instrument that senses infrared radiant energy and visible reflected solar energy from the Earth's surface and atmosphere. The Sounder provides data for vertical atmospheric temperature and moisture profiles, surface and cloud top temperature, and ozone distribution. Other instruments on board the spacecraft are the ground-based meteorological platform data collection and relay and the SEM. The SEM consists of a magnetometer, an X-ray sensor, a high energy proton and alpha particle detector, and an energetic particles sensor. The GOES-N series (GOES-13 through GOES-15) spacecraft also have a sun-pointed extreme ultraviolet sensor. In addition, the GOES satellites carry a search and rescue repeater that collects data from Emergency Position-Indicating Radio Beacons and Emergency Locator Transmitter beacons, which are used during search-and-rescue operations by the U.S. Air Force Rescue Coordination Center. In September 2006, the HES was canceled. Before being launched, GOES satellites are designated by letters (A, B, C, etc.). Once a GOES satellite is launched successfully, it is redesignated with a number (1, 2, 3, etc.). So, GOES-A to GOES-F became GOES-1 to GOES-6. Because GOES-G was a launch failure, it never received a number. GOES-H to GOES-R became GOES-7 to GOES-16 (skipping GOES-Q, which was not built). Once operational, the different locations used by the satellites are given a name corresponding to the regions they cover. These are GOES-East and GOES-West, which watch the eastern and western halves of the U.S., respectively. GOES-East is occupied by GOES-16, while GOES-West is occupied by GOES-15. The -East/-West designation is used more frequently than the satellite's number designation. There is also a GOES-South position, which is meant to provide dedicated coverage of South America. Unless a satellite is dedicated to this continent, imagery of South America is updated every 3 hours instead of every 30 minutes whenever a storm occurs in North America, which is roughly 40 percent of the time during the hurricane season. The GOES-South station is usually assigned to older satellites whose North American operations have been taken over by new satellites. For example, GOES-10 was moved from the GOES-West position to GOES-South after it was replaced in the -West station by GOES-11. When GOES-10 was decommissioned on 1 December 2009, GOES-South was taken over by GOES-12. Since the retirement of GOES-12 on 16 August 2013, the GOES-South station has been unoccupied. Designating GOES-13 as GOES-South after its retirement from the GOES-East position was evidently considered, but this did not take place. In September 2006, NOAA reduced the planned number of GOES-R satellites from four to two because of cost overrun concerns. The planned delivery schedule was also slowed down to reduce costs. The expected cost of the series is $7.69 billion, a $670 million increase from the prior $7 billion estimate. The contract for constructing the satellites and manufacturing the magnetometer, SUVI, and GLM was awarded to Lockheed Martin. This award was challenged by losing bidder Boeing; however, the protest was subsequently dismissed. The ABI is being delivered by ITT Exelis. The SEISS is being delivered by Assurance Technology Corporation. XRS and EUVS are being combined into the Extreme Ultra Violet and X-Ray Irradiance Sensors (EXIS), which will be delivered by the Laboratory for Atmospheric and Space Physics of the University of Colorado. The contract for the ground system, including data processing, was awarded to a team led by the Weather Systems division of Harris Corporation, including subcontracts to Boeing, Atmospheric and Environmental Research (AER), Honeywell, Carr Astronautics, Wyle Laboratories, and Ares. GOES spacecraft have been manufactured by Boeing (GOES-D through -H and GOES-N through -P) and Space Systems/Loral (GOES-A through -C and GOES-I through -M). 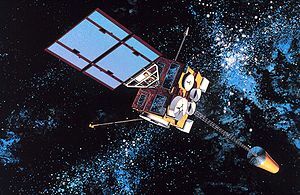 The GOES-I series (I-M) and the current GOES-N series (N-P) are documented in the "GOES I–M Databook" and the "GOES N Series Databook", respectively. The GOES-R series is being built by Lockheed Martin with the first in the series, GOES-16, undergoing on-orbit testing. Boeing would have built and launched GOES-Q only if GOES-O or GOES-P had failed to be delivered on-orbit in good working order. The first image obtained from the GOES-1 satellite, 1975 October 25, 1645 GMT. Lombardi, Michael A.; Hanson, D. Wayne (March–April 2005). "The GOES Time Code Service, 1974-2004: A Retrospective". Journal of Research of the National Institute of Standards and Technology. 110 (2): 79–96. doi:10.6028/jres.110.008. PMC 4847573. PMID 27308105. ^ "NASA Debuts the Entire 2008 Hurricane Season in New On-line Video". ^ "Spaceflight Now". Archived from the original on 11 September 2013. Retrieved 7 May 2009. ^ "GOES-O Mission Page". NASA. Archived from the original on 3 May 2009. Retrieved 7 May 2009. ^ "NASA and NOAA's GOES-O Satellite Successfully Launched". NASA. 27 June 2009. Archived from the original on 29 June 2009. Retrieved 28 June 2009. ^ a b "GOES Spacecraft Status Main Page". NOAA. Archived from the original on 27 December 2011. Retrieved 28 December 2011. ^ Goddard Space Flight Center (16 June 2009). "NASA and NOAA's GOES-O Satellite Ready for Launch". SpaceRef Interactive Inc. Archived from the original on 3 February 2013. Retrieved 23 June 2009. ^ "GOES-14 Replaces GOES-13 as the GOES East Satellite". NOAA. Archived from the original on 1 October 2012. Retrieved 24 September 2012. ^ "NASA's Shuttle and Rocket Launch Schedule". Archived from the original on 13 September 2008. Retrieved 31 October 2009. ^ "GOES-P Mission". NASA. Archived from the original on 4 March 2010. Retrieved 4 March 2010. ^ "GOES-15 Spacecraft Status Summary". NOAA. Archived from the original on 15 April 2012. Retrieved 27 December 2011. ^ a b "GOES-17 Transition to Operations │ GOES-R Series". www.goes-r.gov. Retrieved 2018-10-25. ^ "Goes-3 Satellite Decommissioned After Linking Antarctica To The World For More Than 20 Years". University of Miami. Archived from the original on 28 August 2017. Retrieved 27 August 2017. ^ "GOES-8 Spacecraft Status Summary". NOAA. Archived from the original on 18 August 2006. Retrieved 29 June 2009. ^ "NOAA DEACTIVATES GOES-8 AFTER 10 YEARS OF SERVICE" (Press release). NOAA. 3 May 2004. Archived from the original on 29 September 2006. Retrieved 25 August 2006. ^ "NOAA's Office of Satellite and Product Operations - GOES Status". www.ospo.noaa.gov. Archived from the original on 4 June 2017. Retrieved 24 June 2017. ^ "GOES-R User Systems". www.goes-r.gov. Archived from the original on 2017-06-27. Retrieved 2017-07-18. ^ "Extreme Space Weather Events". National Geophysical Data Center. Archived from the original on 2012-05-22. ^ "GOES-R Spacecraft". Geostationary Operational Environmental Satellite Program (GOES). Goddard Space Flight Center. Archived from the original on 28 October 2014. Retrieved 12 August 2011. ^ Hill, Steve. "GOES-R Solar and Space Environment Data Products: Benefiting Users" (PDF). Geostationary Operational Environmental Satellite Program (GOES). NOAA Space Weather Prediction Center. Archived from the original (PDF) on 26 February 2009. Retrieved 31 December 2008. ^ "U.S. to Reposition Satellite Over Amazon". Associated Press. Archived from the original on 23 April 2006. Retrieved 17 April 2006. ^ "NOAA's newest geostationary satellite will be positioned as GOES-East this fall". www.noaa.gov. Archived from the original on 13 June 2017. Retrieved 24 June 2017. ^ Powner, David (2 April 2009). "Acquisition Is Under Way, but Improvements Needed in Management and Oversight" (PDF). United States Government Accountability Office. Archived (PDF) from the original on 2 August 2009. Retrieved 29 June 2009. ^ "TECHNICAL NOTES ON GOES-7". Archived from the original on 2011-10-08. ^ "GOES-10 Is Going, Going... Gone..." Satnews. 2 December 2009. Archived from the original on 13 May 2011. ^ "GOES Decommissioned Satellites". Archived from the original on 2017-06-04. ^ "GOES-16 to GOES-East Drift Plan". Satellite Liaison Blog. 2017-09-28. Archived from the original on 2017-09-29. Retrieved 2017-09-29. ^ Graham, William (1 March 2018). "ULA Atlas V successfully launches with GOES-S". NASASpaceFlight.com. Retrieved 1 March 2018. ^ a b Ray, Justin (24 October 2016). "GOES-R weather satellite's ride to space being stacked at Cape Canaveral". Spaceflight Now. Archived from the original on 25 October 2016.